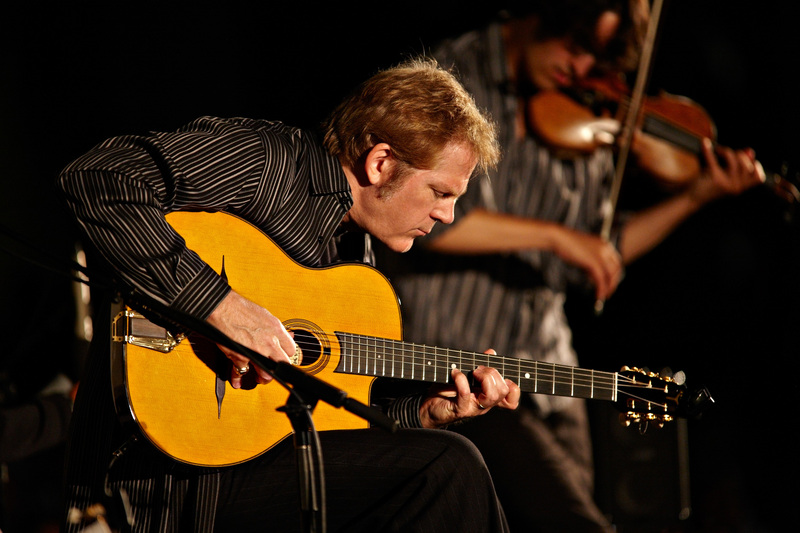 Internationally renowned guitarist, arranger and musical director John Jorgenson and The John Jorgenson Quintet will celebrate “Gypsy Jazz” at the Hawai‘i Theatre on Saturday, June 4 at 7:30 p.m.
Jorgenson and friends are performing as part of the Django Would Go! Music Festival, presented by Hulavillle Events. Hawaii’s own Hot Club of Hulaville will open for them. Led by Grammy-winning guitarist John Jorgenson, The John Jorgenson Quintet creates a unique musical experience that has enthralled audiences around the world and won innumerable accolades and awards. With each member of the group a recognized virtuoso, The Quintet’s style has been dubbed “gypsy jazz” after the dynamic string-driven swing created by Django Reinhardt and Stephane Grappelli in 1930’s Paris. Spanning several decades and many musical styles, John Jorgenson first came to national attention in the mid ‘80s as co-founder of the successful country-rock act The Desert Rose Band. Many diverse artists were drawn to add Jorgenson’s artistry to their own recordings, including Bonnie Raitt, Bob Seger and Barbara Streisand. In the ‘90s The Hellecasters gave audiences a chance to experience John’s fretboard fireworks in an unrestrained venue and the trio’s three original CDs remain favorites of guitarists everywhere. Elton John invited Jorgenson to join his band in 1994 for an 18-month tour that stretched into a 6-year stint of touring, recording and TV appearances. After discovering Django Reinhardt’s music in 1979, Jorgenson became known “the US Ambassador of Gypsy Jazz.” The John Jorgenson Quintet is the only American act to ever headline the prestigious Django Reinhardt Memorial Festival in France, and has been featured at other “Djangofests” in the US, UK, Germany and Canada. For the films “Gattica” and “Head in the Clouds” Jorgenson was tapped to recreate Django’s music, and in the latter he even appeared onscreen as Django with stars Charlize Theron and Penelope Cruz. Adding to the international flavor of the Quintet is Dutch bassist Simon Planting, well known in the gypsy-jazz community from his tenure with legendary Belgian guitarist Fapy Lafertin. Filling out the Quintet are phenomenal young jazz violinist Jason Anick, fiery rhythm guitarist Doug Martin, and veteran percussionist Rick Reed. The combination of these five incredible musicians creates a sound that has been described as dynamic, romantic, driving, and unforgettable. Legends like Elton John, Earl Scruggs and Duane Eddy along with fellow guitarists such as Tommy Emmanuel, Peter Frampton and Brad Paisley all sing Jorgenson’s praises. Also on the program is Hawaii’s top band “The Hot Club of Hulaville” featuring Duane Padilla on violin, Emmet Mahoney on guitar, Ricardo Diaz on contrabass, Sonny Silva on guitar and Ginai as chanteuse. Filling out the card will be musical guests and a special appearance by guitar great Paul Mehling of the Hot Club of San Francisco and Dan Hicks and His Hot Licks. Plus, audience members shouldn’t be surprised if a special guest or two joins in the fun. Tickets are available online at www.HawaiiTheatre.com or by phone at (808) 528-0506. Prices are $20, $25, $30 and $35, with a special “Gypsy Caravan” premium package at $75.00. Gypsies in the caravan receive premium seating and a meet-the-artists reception with champagne, strawberries and cream, and crepes – both sweet and savory. Guitar, violin and bass, workshops and master classes with the performers Saturday, June 4 from 10:30 am to 1 pm. For more information, please call (808) 393.6393. A special show on Maui, 6 pm Sunday, June 5 at the Maui Arts and Cultural Center. There will be workshops and master classes as well beginning at the MACC at 3 pm and a free Gypsy Jam Session at 4 pm. Tickets and information at the MACC Box Office; 242-SHOW (7469) or at www.MauiArts.org. For additional information on any aspect of the Django Would Go Festival, please call (808) 393-6393.